Immunogen: Synthetic peptide corresponding to aa 2-17 of human huntingtin. 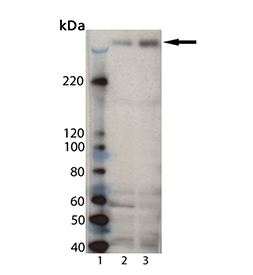 Application Notes: Detects a band of ~350kDa by Western blot. Scientific Background: Huntington’s disease (HD) is a neurodegenerative disorder caused by an expanding polyglutamine repeat in the huntingtin gene (>35 repeats results in HD onset). Expansion of this polyglutamine repeat may induce a toxic gain of function perhaps through interactions with other cellular proteins. The huntingtin protein is thought to be necessary for neuronal survival and is involved in synaptic vesicle trafficking, microtubule binding and may also have a role in apoptosis. SUMO modification at the N-terminus of the huntingtin protein is also believed to play a role in the neurodegenerative process. Western blot analysis of Huntingtin pAb (Prod. No. BML-PW0595A): Lane 1: MW Marker, Lane 2: Mouse Brain Tissue Extract (Prod. No. ADI-LYT-MB100), Lane 3: Rat Brain Tissue Extract (Prod. No. ADI-LYT-RB100).